It had been another long day on the road when arrived on the island, the GPS wasn’t co-operating in the remote location and we were quite anxious about exactly what awaited us our destination. A tattoo-covered local shop assistant kindly used her mobile coverage to pinpoint our destination, and with a photo of her screen we were back on track. We drove through fields of sugar beet and grain, down a winding dirt road and into the courtyard of a beautiful old farm building paved with cobble stones. We couldn’t believe our luck, it was wonderful. Scroll past the photos to read more. Click on an image to view a larger version and enter the slideshow. 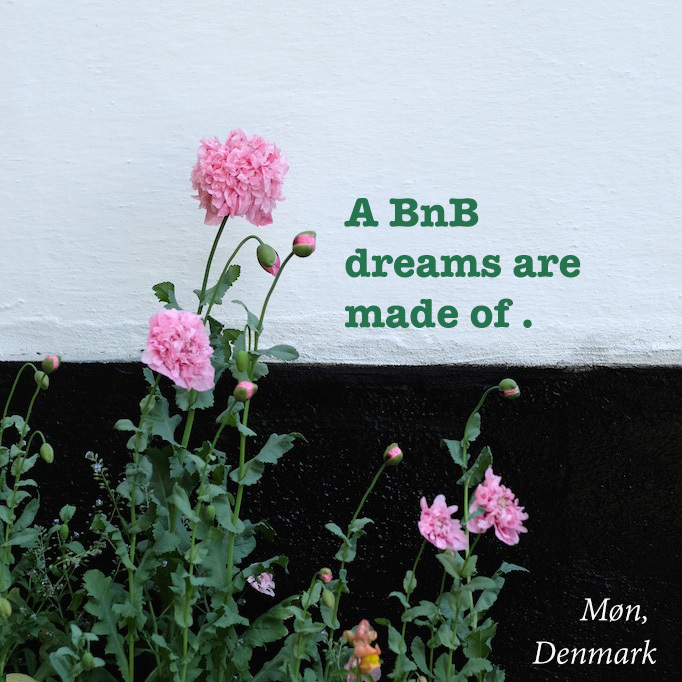 The BnB dreams are made of. Even the wood pile was beautiful. The buildings may have been old, but they had one of the biggest sets of solar panels I have ever seen. You may have spied this fantastic breakfast before in Rich’s postcard. View out into the courtyard from our apartment. Taxadermy and furs usually freak me out, but it seemed to be a big part of their family heritage and none of it looked recent. This guy did freak me out a bit though. I think he was a weasel. Too rodent-like for my tastes. So much love in every corner. I can’t tell you how delighted I was about all the flowers in bloom. Glorious. We were a little heavy-hearted to leave this place. I will be surprised if we ever find a BnB like this again. I was completely delighted with all the flowers in bloom to photograph, the children were delighted with the enormous grassed area out the back to run about in and Rich was delighted we had reached the right place. Our accommodation was part of the farm building converted to a meticulously clean rustic apartment. The owners were welcoming and quietly spoken. They asked if we wanted breakfast and we said yes. We asked where to go for dinner and they told us ‘the butcher.’ On both counts we couldn’t have been more surprised (for a review of ‘the butcher’ restaurant click here). We had been enjoying hotel buffet breakfasts for the past few days and I thought I’d better set appropriate expectations for the children of ‘bread rolls, krockerbrød and cereals.’ We entered the dining room of the hosts’ living quarters and we were gobsmacked. The most awesome breakfast we had ever witnessed lay out in front of us on a red tablecloth. It felt like such special occasion we all began to speak in whispers. Our youngest told us the table looked like it was ‘set up for a wedding,’ the presentation was so beautiful. We sat down and tried to take it all in, but we couldn’t. There was ‘bread rolls, krockerbrød and cereals,’ but also pancakes, vegetable crudités, cheese, cold meats, fresh fruit and berries, fermented milk (Filmjölk) and more. We were already over the moon and then in came a freshly-made omelette. Our eyes popped out of heads and again we couldn’t believe our luck. There were giggles of joy and more excited whispers. We ate and we ate and we ate. Probably too much. And we did it all again the next morning. In between breakfasts we visited some amazing white cliffs that I’ll write about soon, enjoyed an excellent dinner and investigated the farm buildings and garden, but honestly, for all of us it was really all about the breakfasts. Oooh, and there is a vineyard? This BnB sounds like the perfect accommodation for my family! Can you please let me have the name of the place and address?